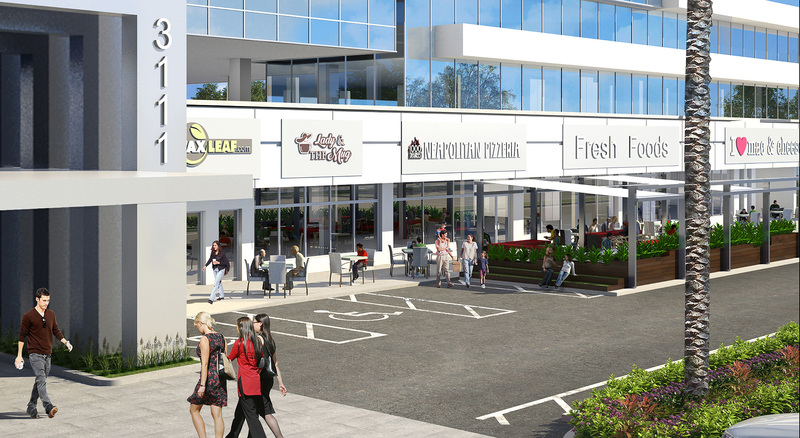 CORAL SPRINGS, FL, July 19 — A joint venture of Bristol Group, Inc. and Butters Construction and Development announced today that four new restaurants will open this year at University Place, a recently repositioned Class A office building in downtown Coral Springs. The new restaurants include Lady and the Mug, 1000 Degrees Neapolitan Pizza, I Heart Mac & Cheese, and Johnny Manãnas. Lady and the Mug and 1000 Degrees Neapolitan Pizza are already serving customers at University Place. I Heart Mac & Cheese and Johnny Manãnas are both expected to open their doors by early fall. Lady and the Mug is a specialty coffee shop conceived of by Coral Springs native, Aimee Tart. The restaurant serves Per’La coffee drinks as well as pastries and sandwiches. 1000 Degrees Neapolitan Pizza is a fast casual pizza restaurant allowing customers to create their own hand-tossed pizza in less than two minutes. 1000 Degrees Neapolitan Pizza has two existing locations in Florida with seven more opening soon throughout the state. I Heart Mac & Cheese is a fast casual restaurant specializing in customizable, made-to-order macaroni and cheese. I Heart Mac & Cheese has six locations opening in South Florida this fall. Johnny Manãnas is a Mexican-themed restaurant complete with a full bar and spacious outdoor patio. University Place was developed in 1985 and has undergone a multi-million dollar renovation. These improvements repositioned the asset as a central hub of the Coral Springs CBD. The project has gained recognition from the South Florida Business Journal as a Best Rehab/Reuse Development Project winner and from NAIOP South Florida as a Best Renovation/Rehab Project finalist. Building upgrades included the reimagining of the asset’s ground floor retail space, exterior architectural enhancements and updates to common areas and office space within the building. Tenants in the 205,000-square-foot, 10-story building enjoy an open and modern atrium, move-in ready office suites with floor to ceiling windows and 360 degree views, reserved garage parking and surface parking, on-site property management, and building security. University Place is situated in the heart of South Florida on a seven-acre site at 3111 North University Drive. There are a myriad of retail, dining, and entertainment options within walking distance of the building including The Walk of Coral Springs, the new Coral Springs Municipal Complex, and the Downtown Art Walk. University Place provides exceptional commuter access via The Sawgrass Expressway, Florida’s Turnpike, and Interstate 95. “The primary objectives of the re-positioning of the building were to provide 18-hour amenities, improve the pedestrian connection to the burgeoning downtown area, activate the ground floor retail space and architecturally enhance the interior and exterior of the building,” said Malcolm Butters, CEO and Co-Founder of Butters Group. Inquiries regarding office space availabilities should be directed to Deanna Lobinsky and Travis Herring of Cushman & Wakefield. Inquiries regarding retail space availabilities should be directed to Jon Cashion and Roxanne Register of Katz and Associates. Bristol Group Inc., founded in 1980, is a nationally active real estate investment and development firm. The firm has acquired, developed or redeveloped over $2.5 billion of real estate. Bristol Group’s current real estate portfolio consists of office, retail, multi-family, industrial, and self-storage, and other specialized properties nationwide. For more information go to www.bristolgroupinc.com. Butters is a fully integrated real estate development, construction, realty and management firm founded in 1990. Based in Coconut Creek, Florida, the company has developed and constructed more than 11 million square feet of commercial space in South Florida and currently manages and leases more than 3 million square feet. The company’s clients and partners include Bristol Group, Principal Life Insurance Co., Morgan Stanley, Fidelity Investments, KTR Capital Partners and Prologis. For more information go to www.butters.com.